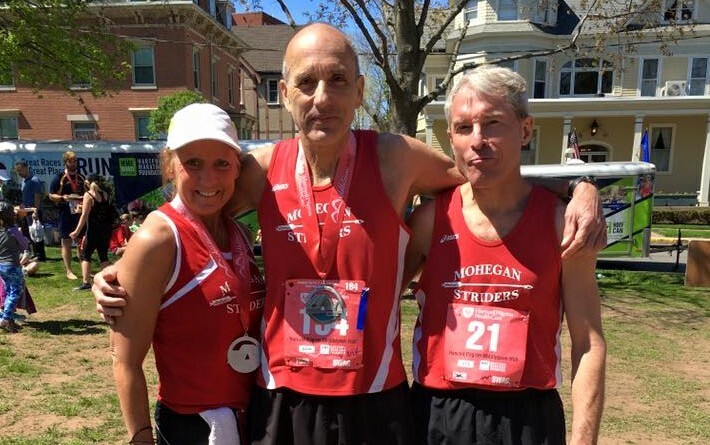 Three teams took home victories at the Harvard Pilgrim Middletown Half Marathon on April 24th but none was more dominant than the Mohegan Striders. With limited fields competing, the Mohegan Striders took all three masters + divisions on the men’s and women’s side. Led by Chad Johnson’s second-place overall finish (1:15:59), Mohegan took first in the masters, grand masters, and seniors division; they were third in the overall competition on the men’s side. For the Mohegan ladies, Tracy Drozynski led the team to second place in the open division and victories in the masters and grand masters competitions. Will Sanders of SoundRunner was the overall winner and led his team to the open championships, followed by Manchester Running Company and Mohegan Striders. On the women’s side, Manchester RC took a 1-2-3 sweep behind Melissa Stellato’s win, teammates Briana Demers and Lanham Miller were 2-3. Manchester RC outpaced Mohegan and Housatonic Road Runners.